Charles Marion Minerd was born on Sept. 16, 1862 at Bridgeport near Mount Pleasant, Westmoreland County, PA, the son of Eli and Mary Ann (Baer) Minerd. 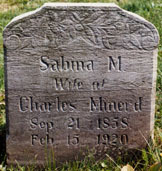 In about 1879, when Charles was age 17, he was united in matrimony with 21-year-old Sabina Matilda "Bina" Pierce (1858-1920), the daughter of James and Sarah (Moore) Pierce. The family lived for decades in and around the coal and coke mining town of Bridgeport. The Minerds produced seven children -- Maud Minerd, Alice Jane Holdsworth, Eva Hillwig, Rev. William Mullen Minerd, Bertha O. Reese, Harry Oliver Minerd Sr. and Ralph Charles Minerd. In 1903, Charles gave his permission for 18-year-old son William to marry 20-year-old Pearl Johnson. Charles' rare signature appears on a consent form, which today is on microfilm at the Westmoreland County Courthouse in Greensburg. When the United States Census was taken in 1910, the Minerds dwelled in East Huntington, Westmoreland County, with Charles and his sons Harry and Ralph laboring at the local coke works. That year, Charles' aged father lived under their roof. In 1913, when the Minerd family held its first annual reunion at Ohiopyle, Fayette County, PA, Charles' brother Rev. Isaac H. Minerd was elected president. Charles is believed to have attended that day, among many of their cousins and friends, totaling 125 people. Son Will became a preacher in the early 1900s and was was assigned to the United Evangelical Church of Bridgeport. In October 1916, he accepted a new position in Johnstown, Cambria County, and the Bridgeport members threw a farewell party in his honor. Charles and Sabina, and their married son Ralph and his wife Violet, attended the affair. Charles is believed to have suffered a hammer attack on the head in late March 1919 by a former Standard mine employee, Joe Welsh. The aggressor, whom the Connellsville Daily Courier said was "mentally deranged," was returned to the Westmoreland County Home after striking himself in the head with the same weapon. The federal census again was enumerated in January 1920. At that time, the family lived along Buckeye Road in East Huntingdon, with the 58-year-old Charles continuing his labor at the coke works. Sabina's unmarried, 65-year-old brother Joseph Pierce boarded in their home that year and worked as a laborer at the local glass house. Suffering from chronic heart valve disease, Sabina passed away at Bridgeport at the age of 59 on Feb. 15, 1920. She was laid to rest at Greenlick Cemetery near Bridgeport. Son in law Richard Reese was the informant for her official Pennsylvania certificate of death. Tragically, in addition to his wife, Charles outlived three of their adult children. The heartache began with daughter Eva Hillwig who died near Greensburg, Westmoreland County, in 1905. Daughter Alice Holdsworth passed away in Punxsutawney, PA in 1932 at age 52. And their son Harry of Bridgeport died in 1938. He also lost a married granddaughter, Nellie Inez Bish, in December 1935. Charles worked as a coal miner near Bridgeport and as a laborer at the coke ovens at Standard, near Mt. Pleasant. When the federal census was taken in 1930, the widowed, 58-year-old made his home with his son and daughter in law, Harry Oliver and Mazie (Rumbaugh) Minerd Sr., in Rostraver Township, Westmoreland County. Both Charles and Harry were employed that year as coal mine laborers, most likely for the Pittsburgh Coal Company at its Banning Mine. In his later years, Charles lived with his son Will in Rockwood and later in Somerset, Somerset County, PA. While in Rockwood, Charles enjoyed visiting with his first cousin, railroader Daniel Martin Younkin, son of John M. and Laura (Minerd) Younkin. In fact, Daniel helped organize the 1918 Minerd-Miner reunion in Rockwood Park. Charles suffered badly from asthma in his later years. He often was confined to his bedroom where he was forced to inhale awful-smelling smoke to help clear his lungs. His grandchildren living with him at the home of his son Will on Race Street in Somerset remembered the smell of the fumes. At age 86, Charles died of the lingering illness at Will's home in November 1947. His obituary was published in his old hometown newspaper, the Mount Pleasant Journal. He was buried beside his wife at Greenlick Cemetery.